As always, Twelve South has delivered an utterly exquisite product in the most recent iteration of BookBook for iPhone. I think most of us can agree, modern life just seems to become more and more demanding every day, as do our expectations around the support that technology and its accessories may provide us. Despite this, the BookBook case for iPhone manages to delivers on every level. It combines refinement and style with a practicality and flexibility that is impossible not to love. The key to its flexibility is the removable shell design, within a beautifully crafted leather wallet. When you want to use your phone in what I like to call “slim mode”, the shell is 100% removable from the delightfully distressed leather “book” casing with a simple click to the left, allowing unencumbered use in a variety of mounts, charge stands, and hands or pockets that don’t like to juggle bulk. With solid bevelling to protect the screen, buttons and ports, the inner shell makes for a great case just on its own. However, when one adds the wallet component, again with a simple click-in of the interior shell, things get taken up a notch. With room for between 5-6 cards including an ID pane (depending on your model of iPhone), a place to stash cash or receipts, a luxurious suede-style interior finish and a gorgeous leather book exterior, it just feels so delightfully “olde-worlde”, yet maintains utter practicality. Features like wireless charging and ApplePay are unencumbered, and with the advent of apps like AppleWallet and StoCard, the need to carry so many cards has dropped to such a level that I actually found myself with a spare card slot – bonus! With the ability to convert to a stand for landscape and portrait viewing, the package is complete. 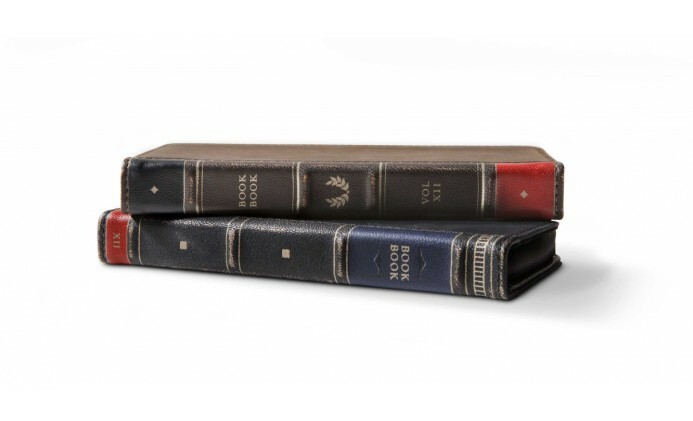 The BookBook by Twelve South gets a 5/5 (and I’m not giving it back! ).